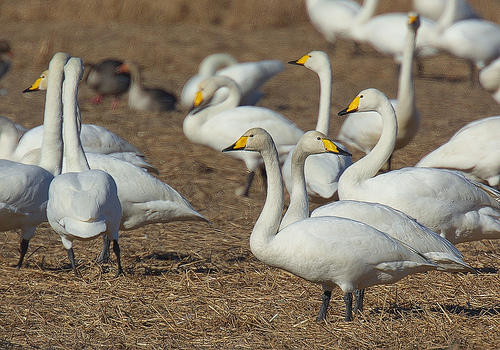 The Whooper Swan breeds in Scandinavia and in winter migrates in small numbers to western Europe. Especially in December and January there is a chance you may see them. They are about as large as the Mute Swan but have a yellow beak. 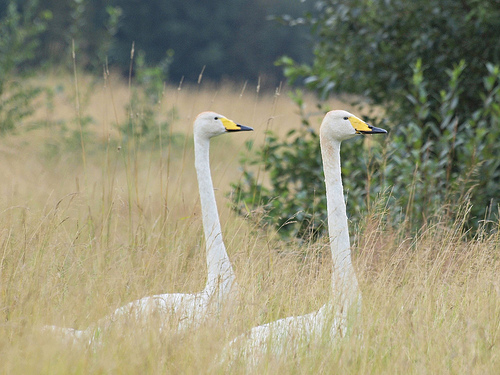 Whooper Swans usually hold their graceful neck straight, while the Mute Swan's neck often is bent in an S-curve. The Whooper Swan has a yellow beak. The colour of the Mute Swan's beak is red or orange.